SCHEDULING CHANGE – DIVISION B-WEST: The Waterfront has backed out of sponsoring their team. Moriarty’s has graciously agreed to pick them up for the remaining three home games on 2/27, 3/6, and 3/20. The schedule has been updated accordingly. This will affect Order in the Cork, Hippy & Friends, and Pond Scum. SCORE SHEETS – There is one CADA drop box, which is at LeRoy’s. This is for league fees & related paperwork only, NO scoresheets. Feel free to give fees to a board member if you won’t be near LeRoy’s by the time they’re due. All score sheets must be submitted via email or text message to the statistician. Scanned PDF files are best, but a clear picture from a cell phone is fine too. If you have questions about how please ask! Sheets should be submitted no later than 3:00 PM each Friday, but earlier is better so we can post results earlier. Ton/Ton+ - for each ton+ you get, make sure that you also mark a ton or you will not get credited for it! Ton/Ton+ and High In/Out – If you score a ton or ton+ as an in or out in ’01, make sure you mark all applicable boxes (i.e., if you get a ton+, mark both ton & ton+; . 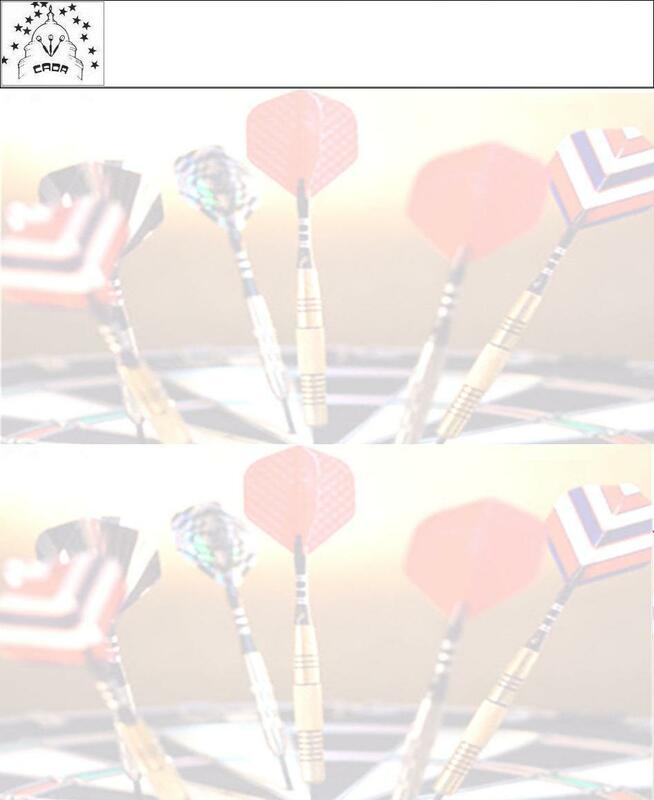 Hat Tricks – a hat trick is all three darts in the bullseye, any combination of green or red. A six pack is all three in the red. Find us on Facebook! If you want to make sure you see CADA’s posts, please verify that your notification settings are configured properly. Click here for an example.